Mail makeover: The new letter box. The department of post (DoP) has seen the future, and it’s all plastic and stainless steel. The rest of the country will get to see this too, when, shiny red plastic-and-steel postboxes start replacing the 590,000 mild-steel postboxes that can be found across India today. And, in an effort to parlay their presence in high-traffic zones in cities, towns and villages into a source of revenue, the new boxes will sport advertisements. If the move works, DoP will find that the cheque really is in the mail. The plastic revolution is the result of work done by the Indian Institute of Technology (IIT) Bombay. “It started as a small project three years ago," said Manjit Singh Bali, chief general manager (mail business) of India Post. “But they (IIT Bombay) did a lot of study and came up with good designs. Now, we are thinking of them (the postboxes) as a potential revenue source, but it will be in a phased manner"
The new postboxes, which will be squat and square, will cost around Rs10,000, almost double what the old ones do, but India Post doesn’t plan to spend a penny on them. Instead, it will, according to Bali, allow agencies buy them, sell advertising space, “and then give us the boxes (back) in three to four years". That’s similar to the build, operate, transfer (or BOT) arrangement used in infrastructure projects where a private company invests in developing infrastructure such as a road, makes money off this for some time (through toll, in the case of roads), and then transfers it to the government. 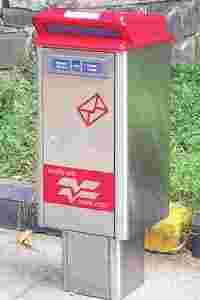 The new postboxes, which will have a longer life and fewer maintenance issues according to its designers, have been created by a team led by B.K. Chakravarthy of the industrial design cell at IIT Bombay. India Post and IIT are now looking to produce 20,000 boxes in the next four to five months in the second stage of the project. “We have a target of 3 lakh boxes in three years," said Chakravarthy. “It will depend on how successfully we are able to sell the concept." “I made the initial 30 boxes myself," said Chakravarthy. “I was also personally involved in making the next batch for the pilot study too." The plastic came from the local arm of Sabic Innovative Plastics, formerly GE Plastics. The boxes—they have a plastic top and a stainless steel body— are assembled by an independent assembler. Chakravarthy said IIT is also working with companies such as Godrej, which makes locks, to see if there was any way in which the cost of the boxes could be reduced. The existing mild-steel boxes need to be repainted every year, are vulnerable to corrosion, and need to be replaced every six years. Their design dates back to the 1900s, maybe even earlier. Each of them has a different lock, which means mailmen who collect mail from several boxes end up carrying multiple keys. The new mail boxes are fitted with a rust-proof lock developed by Godrej, and can all be opened with one master key. “The design aspect had never got our attention before," said Bali. “But the new boxes have a lot of functionalities which makes the job easier. It also fits in with the new brand image we are trying to promote." However, Bali is still not completely happy. He wants the boxes to be a little more red—because Indians are used to red mail-boxes.